This week I’ve adapted a Geneablogger prompt and gathered cemetery pictures that are not individual markers. They are bigger views. I have an affinity for cemeteries. And I know I’m not alone in that among the genealogically bent. When I’m visiting cemeteries, I take pictures that have no record-keeping purpose. Can’t help it – I’m just constantly struck by the view whichever way I turn. It’s the stories buried there. Here’s a sampling of my collection, in an order that brings me home. Right in my town….Baltimore Cemetery…at the end of North Avenue. On the opposite side of town is Loudon Park National Cemetery with its orderly rows. The local granddaddy of them all, historic Green Mount Cemetery with its many luminaries…this shot is of my daughter at the grave of the man for whom her middle school was named. There is MUCH to see at Green Mount (including the plot where John Wilkes Booth is buried) – here is the marker of Elijah Jefferson Bond, who patented the Ouija Board. 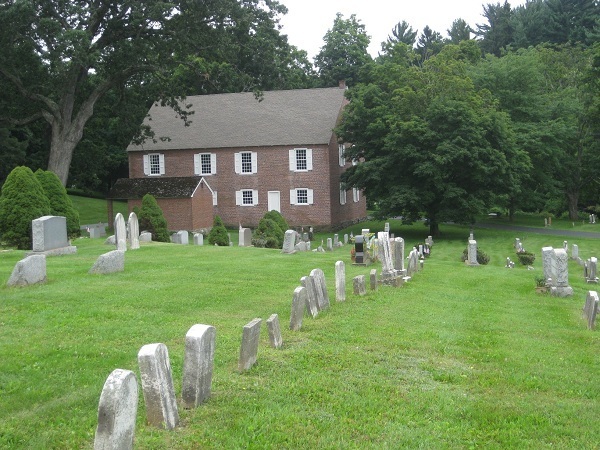 My favorite cemetery, though, is the one right behind my house – Holy Redeemer Cemetery. I have shots from every season but this is what it looked like today. Some are startled by the view from our deck, but I take comfort and pleasure in its constancy. It’s good to see cemeteries where tombstones are lined up perfectly. That’s why I love Loudon Park National Cemetery: because the tombstones fall in place like dominoes side-by-side. The lush environment in these places also makes for a good setting for taking pictures.